“I’m not a racist. I made a terrible mistake,” Donald Sterling told CNN. Donald Sterling was recorded asking his girlfriend V. Stiviano not to associate in public with black people nor bring them to games. But he said he was “baited” into making the remarks. “When I listen to that tape, I don’t even know how I can say words like that,” he said. The NBA has started the process to remove Donald Sterling as owner of the LA team. Donald Sterling, 81, said he wanted to remain the Clippers’ boss and believes that years of good behavior as an owner should help his case. “I’m a good member who made a mistake,” he said. NBA Commissioner Adam Silver banned Donald Sterling from the sport and fined him $2.5 million last month. The NBA is also hoping to force Donald Sterling to sell the team, which would require 75% of NBA owners to vote in favor of the move. Adam Silver believes the NBA will get the votes it needs but lawyers say the Clippers’ owner could oppose the sale in the courts. “If the owners feel I have another chance, then they’ll give it to me,” Donald Sterling said. 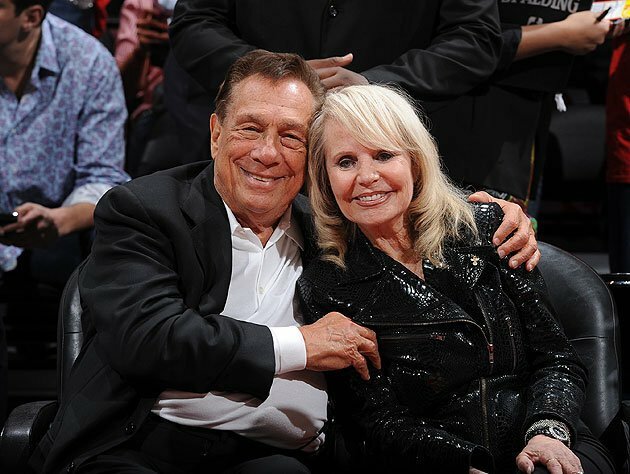 Donald Sterling’s comments came as ABC News posted excerpts of an interview with his estranged wife Rochelle “Shelly” Sterling. Rochelle Sterling, who holds a 50% stake in the team, said she would fight to keep hold of her share. “I will fight that decision,” she said. “I don’t know why I should be punished for what his actions were,” Rochelle Sterling added.